Progressive retinal atrophy, also called PRA, is an inherited disease of the retina that leads to blindness in affected dogs; it includes several different genetic diseases that lead to the degeneration of the retina. In case you aren’t familiar with eye anatomy, the retina is the thin layer of tissue lining the inside of the eye that acts like the film in a camera (or a sensor in a digital camera for millennial readers). It converts the light signal it receives into an electrical signal it transmits to the brain for processing via the optic nerve. When an animal has progressive retinal atrophy, either the retina fails to develop properly or the photoreceptors (light receptor cells of the retina) degenerate. The end result of PRA is progressive vision loss ultimately leading to blindness. PRA is usually inherited in an autosomal recessive manner, meaning that affected animals inherited two copies of the mutated gene — one from each parent. Dogs with a single copy of the mutated gene do not show signs of the disease and are called carriers. Other modes of inheritance are autosomal dominant (only a single copy of the mutated gene is needed to cause the disease) and X-linked (the mutated gene is on the X chromosome). Dogs affected by progressive retinal atrophy present with night blindness. You may notice that your pet has trouble seeing at night or whenever it’s dark. 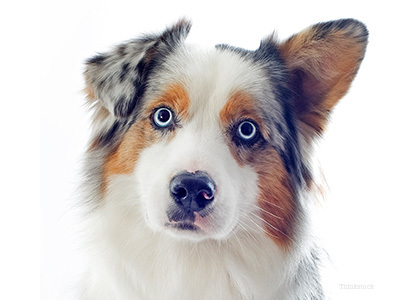 In addition, your dog’s pupils may always seem to be dilated. As the disease progresses, pets also lose the ability to see when it is light and eventually go completely blind. At that point, you may notice your pet bumping into things, especially in new environments. If your dog has trouble seeing, be sure to take him to your veterinarian. The diagnosis of progressive retinal atrophy is usually made after examining the retina. Electroretinography (measuring the electrical response of retinal cells) and genetic testing can be ordered to confirm the diagnosis. Unfortunately, there is currently no treatment for progressive retinal atrophy. However, researchers have identified many of the genes that cause PRA — enabling the development of genetic tests to identify affected dogs and carriers. Breeders of predisposed breeds can test their breeding animals with these genetic tests to be sure their animals are not affected and are not carriers.